Anna Iourenkova’s book, Back to Myself or My Way Towards Happiness, thoughtfully reflects on many stages of life through heartfelt, discerning verse. Iourenkova’s introduction lays the foundation by describing the subsequent text as a self-reflective guide to inspire the reader to embrace his or her own path. She covers temporal topics, like career paths, the turbulence of love, and perceptions of femininity, as well as more consecrated subjects, such as nature, spirituality, and the human soul. Her passages flow with vitality across the pages, encouraging and comforting the reader. Iourenkova’s poems reinterpret difficult periods of a person’s life, including depression and the dissolution of relationships, to inspire and comfort readers. By no longer perceiving these stages of life as failures or shortcomings, a reader can now comprehend these experiences as brief, influential stretches meant to grow the individual. The poems of Back to Myself or My Way Towards Happiness tenderly describe Iourenkova’s experiences to reassure the reader that everyone goes through difficult moments and must choose how to handle those situations. For Iourenkova, a healthy relationship with oneself prevails as the key solution; however, throughout the book, she encourages the reader to identify his or her own path to satisfaction. Through embellished metaphors, pastoral analogies, and relatable trials, Iourenkova invites the reader to seek his or her own gratification in order to achieve individual peace of mind. Her words will resonate with younger readers early in adulthood, as well as older readers taking stock of life. With several of the poems translated from French or Russian, Iourenkova develops a body of work that seems to transcend the expectations and limitations of gender, nationality, and office. Iourenkova’s Back to Myself or My Way Towards Happiness will leave readers with a sense of understanding and fulfillment through enduring ornate descriptions and stunning imagery that dance harmoniously across one’s mind. What language could capture the elegance and the rapture of the soul in contemplation of its beauty, its moments of ecstatic joy and lonesome languor but simplicity? Back to Myself: Or My Way towards Happiness by Anna Iourenkova is a charming collection of poems that will delight many lovers of meaningful verses. In this collection, the poet offers humankind a treasure of her moments of contemplation of life and happiness, it’s a poetry that candidly celebrates the beauty and pain, the triumphs and failures of life, and it is evocative of the different seasons of the human soul in quest of happiness. As one reads Iourenkova, one gets the feeling that one was seeking sense in the very different moments and emotions that flood the human spirit. Some of the poems are short and deceptively simple, but they are packed with a rare intensity of emotions and love. The imagery is vivid and reminiscent of the overall context within which the poems are written. This collection will undoubtedly appeal to a wide audience, especially those looking for interesting poetry to read. "Anna Iourenkova has certainly taken her place in the world of contemporary poetry. 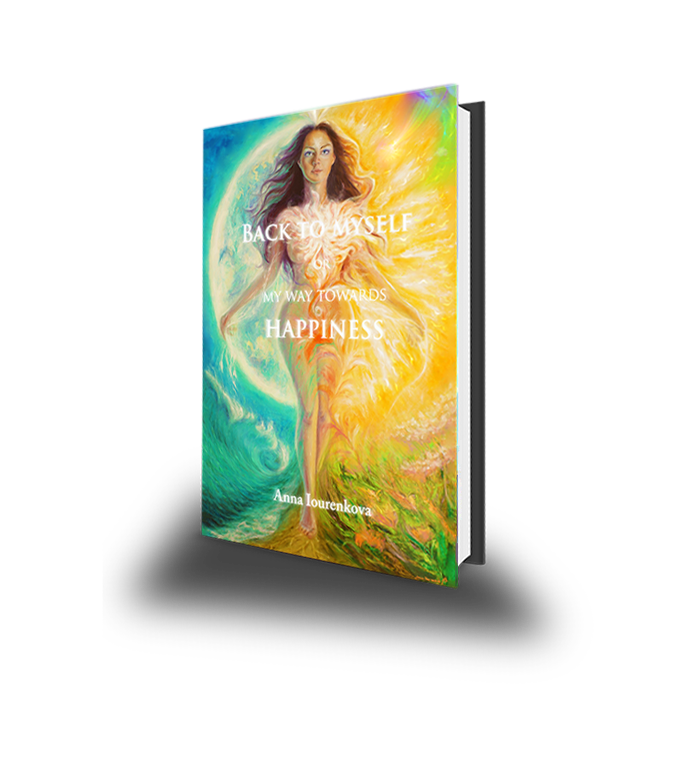 Through these poems, we follow her on her journey towards happiness and self-enlightenment. Guided by nature and the Universe, Iourenkova writes about her own personal experiences, how she got through them, and what she has learned from them. From her darkest hour to a mindful awakening, she adeptly turns her words and thoughts into stunning images and beautiful metaphors. Iourenkova’s poetic musings on nature, healing, travel, the Universe, relationships, women and society share a keen insight on the many ways in which the world works. The way she paints and depicts life on her canvas will certainly serve as an inspiration to all those who read it." Extract from "In symbiosis with the world"
"...Life's geyser floods from every side. Its measures are immeasurable by any bite. The worth's ersatz escapes, empty, from my sight. But everything breathes with a meaning outright. awakes my soul that civilizations can't chastise. Any darkness melts in a bright light. The world's beauty opens in its greatness day and night..."
Extract from "I will live my life"
"...Existence's sea now is shallow to me. dissipating nightmare's mist with its bright security. I will stay alive despite any doubt and fright. What could scare me more that an empty life ? with my mind's wind I'll direct my life's sails..."
Extract from "We fall in love... but we love"
we pray to never stop this falling..."
on the silk of petals glare..."
Extract from "Listen to your Soul"
"...In sanctimony's world Soul is your shield and sword. It's able to cut false anxiety's burden's cord. that you searched for in people's eyes, it's real. Soul is an oasis of abundance in the desert of need. Soul is a candle burning in the darkness of greed. Soul is a gate to the country of unconditional love and bliss. Soul is a pure reflection among crooked mirrors abyss..."
throwing winter out of my heart. wakes me up with its romantic dart. freeing itself from squeezing frames. Shoots conquer a new space in their evolution. A necessary change that nature claims. full of new energy, erects. to the renewal’s flow intuitively all connects. Extract from "In the sea's uterus"
making meaningless all earthling grief. Separated by the surface contrary worlds coexist. one has no sense for the other, forced to desist. Nothing is absolute. This is the gist. a civilization is a mist. Extract from "Sensor and dispenser"
I'm listening to a vibration of the Universe. My head becomes a container for its coming verse. increasing slowly, the words flop. These waving threads are weaving in the space. from all this flow that I embrace. in foretaste's anticipation, not without an inner yell. with my awakened brain's hungry cells. Born in Russia and living in France, Anna Iourenkova is a certified practicing hypnotherapist, a painter and video-meditation creator. Creation of all kind is an important part of her life, poetry is its most recent child, but it has already been noticed in Russia, having been nominated for two Russian National competitions “Russian Heritage 2016” and “Poet of the Year. Debut 2016”.